Today in the Bowl du Prado at Borély in Marseille, the public was there to witness the prowess of the best skaters from the 4 corners of the planet for this key event in the world tour this year which has eight steps. There were 24 riders for the quarter-finals of the Other World Cup Skateboarding, 24 skaters that were intended to accomplish two individual lines of 40 seconds followed by a jam session of four before a panel of five judges including an international judge of the World Cup Skateboarding. Le Bowl du Prado view from the beach. Of the 12 finalists of the day in quarter-finals, the last 6 will play the final tomorrow and the first 6 will meet for the Super Final. - In the super final will be played tomorrow afternoon, two French, William Mocquin last year's winner of the French stage and Julien Benoliel. The first of the finalists so far is Milton Martinez, Argentina, followed by Nolan Monroe, USA. There are also great for that final Ivan Rivaldo, Spain and Jason Singler, USA. 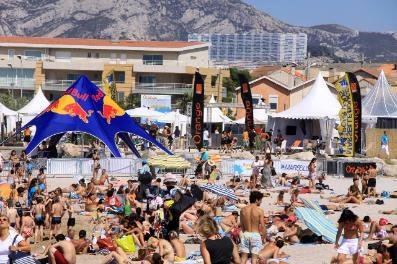 - In the final, the young Vincent Matheron Marseille (13), who won Wednesday's wild card riders to face the pros, will still be here tomorrow along with Alex Sorgente, USA, Steve Pineiro, USA, Stephan Boussac, France Mehdi Salah, France and Jarne Verbruggen, Belgium. A victory for the local organization of the World Cup since the three French nationals are of Marseille! Points earned by each rider participating in these two sessions will determine the final ranking and the podium of the French stage. Results will be announced tomorrow at 19pm on Sunday Borély bowl. 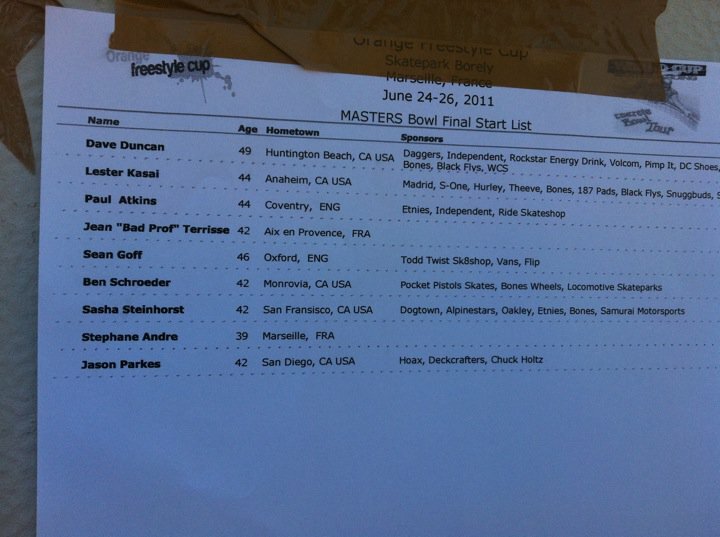 - 16H: Grand appointment tomorrow in the bowl competition with the Masters (over 40 years). BENJAMIN CHASSELIN will be present (FRA), SASHA STEINHORF (USA), Stéphane André (FRA), PAUL ATKINS (UK), BEN SCHROEDER (USA), Jason Parker (USA), Dave Duncan (USA) and LESTER KASAI (USA) 44 years old California, one of the legends of the circuit. Final results Super Final and Pros. Congrats to all! Milton was on fire all week, but after blowing his 2 intro runs, Nolan Munroe took advantage and skated to the win! Next stop Rome World Cup next week! Thanks to Sasha Steinhost, Dave Duncan, Patrick Lozano. Thanks to the WCS, home of the Bowl Spirit Woldwide.